Good Morning bloggers, it's Saturday morning so It's time for a new challenge today at Allsorts. Here is what I did, I used an Inkylicious stamp called field Poppy, and decided to make a background using my new Distress Oxide inks. They are new to me and I have just started to play with them and enjoy the effectives I'm getting. I coloured the image with Spectrum Noirs. Kept the card simple to show the background and image to it's best. Don't forget to head over to Allsorts for all the details of this challenge, and to check out all the fabulous inspiration from my very talented team mates. At Stamping Sensations this month the theme is 'Over The Rainbow' So this can be something inspired by the colours of the rainbow or by the song. For my rainbow colours I used Distress Inks, then used Indigo Blu stamps.added some Glamour dust for the butterfly wings. The sentiment is from Stampin Up, I kept this card really simple so I didn't loose the colours of the ink. This is not my usual style but my good friend B sent me some very good card to use with my inks and it's worked a treat. So all this time I thought I couldn't get it right it's all been down to the card I have used. Thank you Brenda, I've enjoyed getting inky. And of course, the Design Team have created some stunners to inspire you. Please do pay them a visit to their individual blogs - it means a lot to know you appreciate their efforts. At Stamping Sensations this month the theme is 'Over The Rainbow' So this can be something inspired by the colours of the rainbow or by the song. For my rainbow colours I used Distress Inks, then stamped some silhouette stamps and did some highlighting with a white gel pen, and oh I nearly forgot some Glamour dust for her wings. I know due to a Bereavemnet I haven't really been around but I am trying to do bits to get me back into crafting. Hello blogging friends, I know I have not been around for a while due to bereavement, but I'm trying to do bits to get back into crafting again. So it's Saturday morning and that means It's time for a new challenge today at Allsorts. This week is my turn to host and I would like to see 'Seasons - Which Is Your Favourite' We would like to see a Season on your creations, but you must state which season you have chosen. My favourite Season is Spring, I love Winter too but used spring for my card. I've been buying Tulips and I'm loving the assortment of colours you can get, so I used Tulips for this card. The sentiment tags are stamped in purple, but looks dark on the photo, it's a new ink to me I got as a gift, so thought I'd try it out, I love it, it's Versafine Claire in Monarch. And the pearls started of as white and I coloured them to match my card using Spectrum Noir markers. This week is Kath's theme and she would like to see 'Milestones', so birthdays with numbers. So it is my son's 13th Birthday on Thursday 17th January, and he loves football and rugby so I made him a Rugby card in the Leeds Rhino's colours. A simple card as I've not got my mo-jo back yet, I coloured it with Distress Inks, some new colours I got that I'm trying out. Good Morning bloggers, it's Saturday morning so It's time for a new challenge today at Allsorts. This challenge will last 2 weeks to cover Christmas and the New Year. This week is my turn to host and I would like to see 'Thanks A Bunch' creations, so that can be thank you or focal flower creations. I used a range of stamps from The Stampman, and decided to keep it quite simple, I decoupaged the flowers after colouring with Twinkling H20's. I added some liquid pearls and gold stickles to add interest. I would just like to explain my absence from blogland for the last 5 months, my eldest son Scott tragically passed away in July 2018, at the age of 22 years. So as you can imagine it has been devasting for us and I have had to take a break. I am still on a break, but as Brenda has been ill I have stepped in to help run her challenge blogs, but I am not creating anything yet as I have no mojo. I do hope to return in the near future. The card above I already had made, so thought it was a shame to waste it when it was so fitting for the theme. Welcome on this hot and sunny day, it's football for me again today, plenty of sun cream and bottled water I think. It's a new month for Stamping Sensations and Penny black & More @ Allsorts challenges, if you didn't get the chance to join in last month's challenges these could be the ones for you. At Stamping Sensations this month the theme is 'In The Garden' I used this image and went with in my mind fairies at the bottom of the garden. I fancied a change and did some water colouring for this, I even went as far as die cutting my flowers then colouring them with water colours too. Lots of distress inks and a bit of lace finished this off nicely. And now onto my second challenge creation for Penny black & More @ Allsorts, where the theme is 'Things With Wings' I went with this cute little Fairy babe, the inspiration for my colour scheme and papers was the ladybird he is holding. Yes I have called it a him as I think it's a little boy. 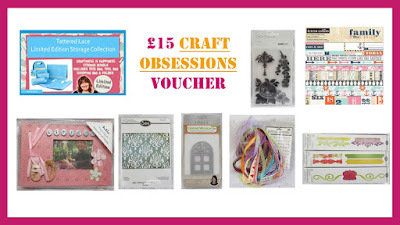 We have prizes from Penny Black, Stamp Addicts, Marianne Designs Now isn't that a lot of prizes, definitely worth getting your stamps out isn't it!!!!!! Now if you would like to be a GDT for us, all you need to do is make a creation to fit the theme following our rules. Are you wanting some inspiration, pop on over to the challenge blog and then you can see all the wonderful creations from the rest of the talented team. Thank you for popping by my blog. Good Morning bloggers, hope everyone is enjoying the beautiful weather, a bit too hot for me. Last Sunday we had a football Gala, Bobby's team got into the final and won, all I got was bad sunburn, I was covered with a thin blouse on and it burnt straight through. This week it's a big match, but I will make sure I'm protected better. Bobby is doing brilliant at football at the moment, and it's nice to have some good weather for it. I'm so used to standing in the freezing cold and rain LOL! So back to this mornings challenge at Allsorts. I love this baby elephant, I usually do it for a new baby card but decided this time to go with Birthday. Well you couldn't get any sweeter than a gingerbread house with sweets, I love using this Christmas image, it's so cute. The die cut is a Memory box die called Glowing Candles, I snipped off the candles to make it into a garland of Holly, and added red gems as berries. 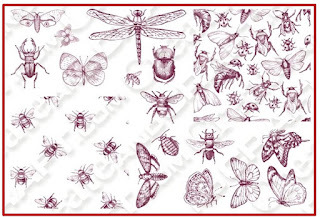 Welcome to my blog, we are mid way through the month so I have a reminder for Stamping Sensations and Penny black & More @ Allsorts challenges, if you didn't get the chance to join in last month's challenges these could be the ones for you. I took my inspiration for this creation from my Creative Stamping magazine and free stamp set. Our lovely Teamie Sally has a fabulous collection of her own cards in the magazine, I aimed for a masculine card hence no embellishments. I quite enjoyed the simplicity of this, and there's many more stamps to use in the set. I wanted to use a stamp I haven't really used much, this little cutie is a bit small to take centre focus, so found a different way to use it. I love the wood effect paper with this, kind of makes it a bit more of a garden theme. 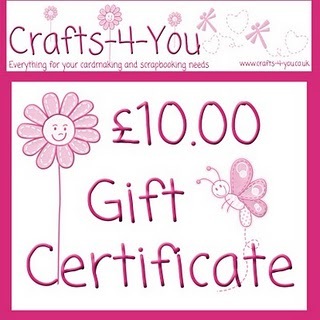 We have prizes from Penny Black, Swedish House Crafts, Crafty Ribbons . Now isn't that a lot of prizes, definitely worth getting your animal stamps out isn't it!!!!!! I got this new stamp as a Birthday Present from my lovely friend Bx, and I loved it so much I just couldn't wait to use it, so I worked the theme around the image. I decided that to use patterned papers on this card would retract from such a beautiful image. I used a total of four dies for this theme, see below for details. I think this stamp I have used was a freebie, a lady with a cocktail represents a night out in my eyes. I went with very girly colours, pinks and lilacs. Welcome to my blog, it's a new month for Stamping Sensations and Penny black & More @ Allsorts challenges, if you didn't get the chance to join in last month's challenges these could be the ones for you. 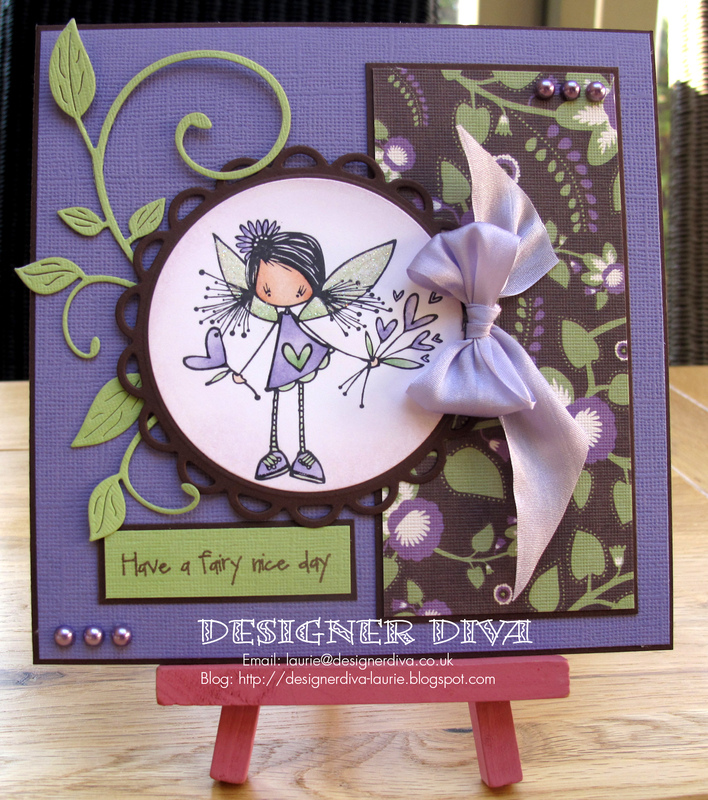 At Stamping Sensations this month the theme is 'Anything Goes' I just love this image, it's both cute and pretty. I made the background paper using quite a plain patterned paper, inked the edges and then stamped dandelions on and added some glamour dust. I made a butterfly out of vellum and glittered it with stickles. Penny Black's Garden Visit image is ideal for this theme, I framed it with a lovely Marianne die set. Good Morning bloggers, it's been a wonderful week weather wise, I've managed to get lots done in the garden. There's lots of colour now appearing in the garden and everything looks so pretty. As it's Saturday morning It's time for a new challenge today at Allsorts. I have used these stamps before, and love them. They are so cute and suit a more simple design. I put a little twist on this challenge by using rabbits dressed up as Bees, I did add some extra bees too. I haven't used a Happy Hoppers image for a while, and enjoyed colouring this image. This week our theme is 'Happy Birthday' so it can be anything to celebrate a Birthday. 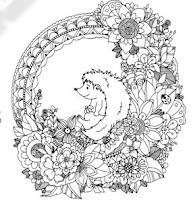 I love this image, super cute and a delight to colour, I used this Lili Of The Valley stamp, and mounted it on to a Tattered Lace frame. 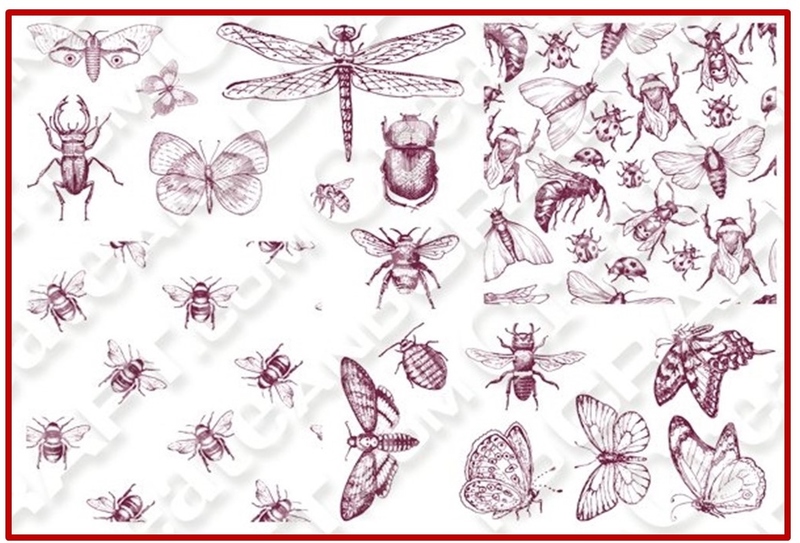 I always choose my stamp then pick papers I think suit the image, then colour my image to go with the papers. 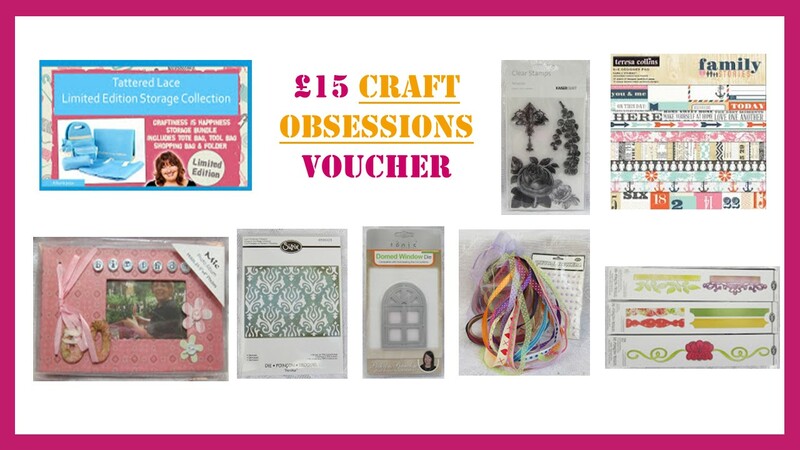 A special Birthday deserves some special prizes and we have nine of them including a store voucher from Craft Obsessions, that's one for every year. Otterly ready for a cup of tea! I'd like to take this chance to remind you of the challenges at Stamping Sensations and Penny black & More @ Allsorts challenges, and if you didn't get the chance to join in last month's challenges these could be the ones for you. At Stamping Sensations this month the theme is 'Close To Nature', I chose to do a Father's day card and used this Otter, because it's a masculine card I kept it quite simple. And now onto my second challenge creation for Penny black & More @ Allsorts, where the theme is an easy one 'Anything Goes' So you can use any stamp for this challenge. I went with this Tea Cozy stamp and made my Mum a birthday card for July and went with pretty florals with the paper and embellies. We have prizes from Penny Black, Crafts U Love, and Rare Earth Stamps . Now isn't that a lot of prizes, definitely worth getting your animal stamps out isn't it!!!!!! So when I read the theme, I read it wrong and had the wrong thing in my mind, I thought it was Pretty in Pink, then the song Pretty Flamingo jumped in my head, and that was it, I'm still singing the song now. Manfred Mann released that song in 1966 which is 3 years before I was even born but I grew up listening to all sorts of music as my Dad plays music of all types all the time, and sixties music I listen to a lot. Anyway this lead to this card, as I knew I had a flamingo die and some flamingo papers. 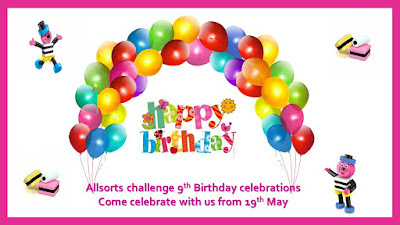 And just to give you a little info for an upcoming challenge, Allsorts celebrate their birthday on the 19th May, so watch out for it as there is always great prizes, you can share this on your blog too. 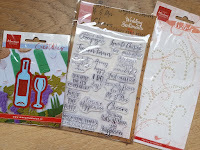 It's a lovely Bank Holiday weekend and the only thing I have planned is gardening, so it's a new month for Stamping Sensations and Penny black & More @ Allsorts challenges, and if you didn't get the chance to join in last month's challenges these could be the ones for you. And now onto my second challenge creation for Penny black & More @ Allsorts, where the theme is an easy one 'Anything Goes' So you can use any stamp for this challenge. Good Morning bloggers, it's Saturday morning so It's time for a new challenge today at Allsorts. And I would also like to share news of our new addition. I thought I would make this cute little gift handbag, It's my daughter's birthday on the 1st of June and I have seen a cute cat paw Pandora charm for her, so this little bag will be purrrrrrrrrfect. I used a die set to make it by 3 Diemensions, there's lots of components so you can make lots of different designs. 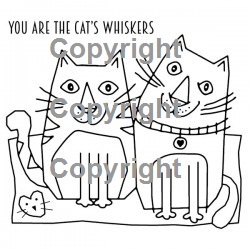 It is National Pet Awareness month which runs until 5th May and this weeks is also RSPCA week, not to mention World Veterinary week from the 30th, so all in all lots happening associated with our beloved pets. All promote the care and welfare of domestic animals be they small or large, the clue is in the title but basically we would like to see anything from mice to canaries, cat's and dogs right up to donkeys and horses. I thought I would use this Barkley stamp, with the dog and cat on, chilling in an hammock. I'm not myself this week and struggled with my mojo, so not entirely happy with it. Papers - Papermania - Henbury Lane. 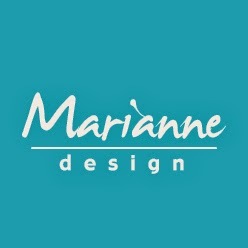 Welcome to my blog, thank you for spending a little of your time looking at my blog. Please leave a comment so i know you've been, Thank you.